Vertically-integrated manufacturing provides economical solutions to precision bearing-based subassembly needs. Whether your objective is low cost or high performance, you can save money and time by having Dynaroll manufacture your bearing subassemblies. Using the links to the left, please feel free to peruse our Mechanical Assemblies section to get a feel for our wide-ranging capabilities and services. Dynaroll offers rapid prototyping (Sterolithography) design services as well as production volumes ranging from small batches to very high quantities. 100% inspection and 100% testing of all parts is available. 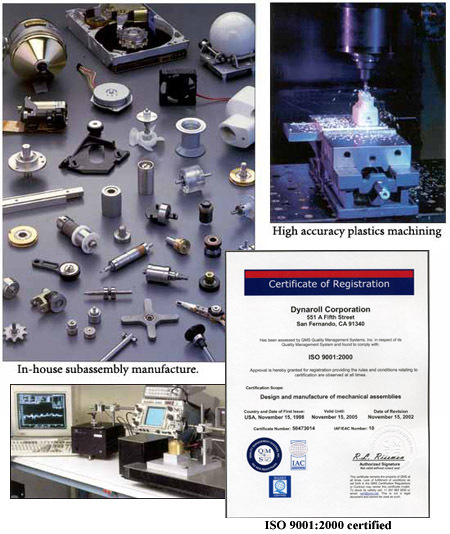 Dynaroll is ISO 9001:2008 approved and is a supplier to FDA-critical and PPAP standards.